How to Sew in Human Hair Weave Wefts or Hair Extensions to Lace Front Wig or Full Lace Wig? Lace wigs create beauty by the natural appearance of the hairline and scalp. This is the part of the lace wig that must be preserved, not to say it is a fashion product just like cloths. After many times of washing, combing and brushing, strands of hair fall out gradually. Over time, lace wigs can become so thin that many consumers think they have to buy a new lace wig. 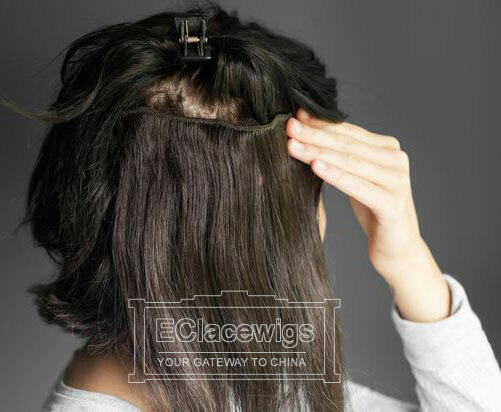 If you have a lace front wig as opposed to a full lace wig, however, you can sew it onto a weave weft hair for added thickness. With full lace wigs, you can only add length with hair weave wefts sewn behind the hairline. Things need to prepare in advance:Hair weaves or clip-in human hair extensions,Hair sewing needle,Thread. 1.Purchase human hair weave weft or clip-in hair extensions identical in color and texture to that of your lace wig now. 2.Place the lace front wig or full lace wig wrong side up on your head. Part your hair from ear to ear using the back edge of the exposed lace as a guide. This part is where you will sew your lace wig down to cover the weave wefts that will be sewn in. 3.Remove the lace wig. Clip down hair in the front to separate it from hair in the backside. 4.Make four vertical, equal-sized parts in the back of the head. Braid connecting U-shaped cornrow using two sections of hair at a time. Equal-sized cornrow in the back are important, because this is where the human hair weave wefts will be sewn in on it. 5.Start by braiding sections of hair closest to the ears down, and connect them in an upward braid with hair in the adjacent section. All your parts will be visible when this is done correctly. 6.Make cornrow in the front going back to meet the upward cornrow shooting up from the back. You can part anyway you like as long at the cornrow are going backward with the width. 7.Sew loose cornrow together along your horizontal part to create an anchor track. This is where your lace wig will be sewn in with lace wig hair. 8.Sew in your human hair weave wefts horizontally across the back of the head until the entire back of your head is covered up to the anchor you made in the horizontal part layer. 9.Place your lace front wig or full lace wig on top of your head. The back of it will line up with the braid anchor because you used it as a guide in Step 2 to make your part! 10.Sew the back of the lace wig onto your anchor. Use brush to blend the lace wig hair into the weave hair..
11.Lift up the front of the lace wig and attach it to the scalp as you normally would with either glue tape or adhesive. 12.Apply oil sheen and hairspray as needed for a smooth hair appearance. View previous：What is the Difference Between Single and Double Knots in Human Hair Lace Wigs?